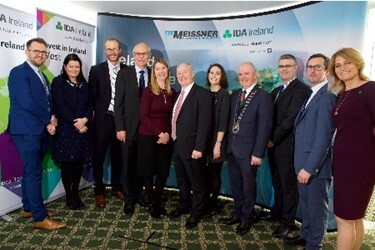 At a press conference in Ireland on 01 FEB 2019, Meissner Filtration Products announced that it will expand manufacturing operations by establishing a facility in County Mayo, Ireland, creating upwards of 150 jobs over the next 5 years. In order to be operational in Q1 2020, Meissner will take advantage of a brand new existing 34,000 ft2 Advanced Technology Building constructed by the IDA in Castlebar, expanding it to 100,000 ft2 . Meissner has also purchased the adjacent land in order to be able to more than triple the facility’s current footprint. Meissner plans to install a substantial, state of the art cleanroom within the existing facility to be used for the manufacture of Single-Use Systems (SUS) that support their biopharmaceutical and pharmaceutical client base. Meissner currently has a manufacturing campus in Camarillo, California, U.S.A., a European logistics hub outside of Frankfurt, Germany, and multiple sales and support offices throughout the world. The facility in Castlebar, Ireland, represents their first manufacturing facility in Europe. Initial operations at the facility will include SUS manufacturing, quality and regulatory, engineering, and customer service. For more information about new and emerging roles, please visit www.collinsmcnicholas.ie/meissner. Meissner enables pharmaceutical and biopharmaceutical manufacturing by providing advanced process solutions that encompass a wide variety of filtration media available in an unparalleled range of form factors, innovative single-use systems, and an expanding portfolio of automation platforms. Their team of experts provide support throughout the lifecycle of a client’s process, from design engineering, to implementation and validation services, through logistics assistance. Meissner’s global customer base is serviced through a worldwide network of personnel. For more information, visit www.meissner.com.